Last week the internet got VERY excited about Beyonce’s long-awaited foray into social media, but why has Tumblr played such a central role? The internet freaked out last week when the awesome and usually super private Beyonce published her first ever tweet and launched a shiny new Tumblr. Even those who aren’t obsessed with her girl power tracks and diva-ish strut couldn’t get enough of the fact she’s now conversing (well kind of) with us mere mortals online. Her first tweet and subsequent Tumblr posts are really interesting because she’s one of the few celebrities who hasn’t shared intimate details of her life online before (we’re looking at you Kim and Lindsay). Beyonce and her hubby Jay Z are notoriously private and now the fact that they’re suddenly publishing personal photos of themselves is a BIG FREAKING DEAL. Hell there’s even a (supposedly) handwritten note from Bey herself. This is too much. However, as much as we can’t get enough of celebrities here at Shiny Shiny, we’re mainly interested in why Beyonce and her entourage specifically chose Tumblr to give us a sneak-peek into her enviable lifestyle. Photo content looks so damn good, we’re convinced that even if a developer created the EXACT same theme in WordPress it’d just lack the same Tumblr photo magic that makes blogs on the platform look lovely. From what we can tell so far, a large part of the social media strategy behind the Beyonce brand is to provide fans with an exclusive insight into her world through the use of LOTS of photos. She even writes on the handwritten page that it’s about seeing things “through my eyes”, which is insanely appealing to dedicated fans, so obviously needs to look as amazing as possible. 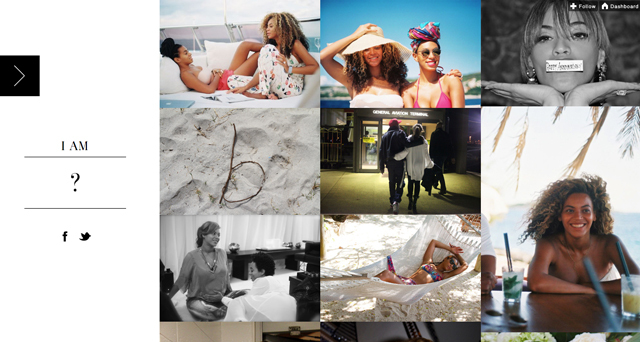 The choice of photos is interesting too, we’re not just bombarded with press shots or the kind of paparazzi photos we’re used to seeing on gossip sites, but instead the selection really does make us feel like we’re getting a sneak-peek into Beyonce’s ACTUAL life, with plenty of intimate candid shots that definitely make her seem more, well REAL. Despite the fact that there are plenty of shots of Beyonce fooling around with no make-up on, let’s not forget that she’s a pretty stylish lady too, and we’re sure her outfit shots will be popular among Tumblr’s growing fashion community. It’s so easy for non-techies to engage, follow and like, Tumblr is just so easy to use, whether you just want to scroll through other blogs or publish content yourself. For an artist like Beyonce with such a massive following that consists of all kinds of different people, a simple platform like Tumblr just seems to make so much sense. Not only will it mean her content is more accessible to non-techies, but there’s also (we think anyway) more chance that the content her team does post will get “liked” and “re-blogged” by other Tumbloggers too. After all we don’t know a platform that makes it as achingly simple to re-publish other people’s content. It doesn’t look like a regular, wordy blog, which even the dullest celebrities have attempted to cultivate in the past. Now we’re not saying Beyonce wouldn’t have PLENTY of great things to write about, but the blog has been positioned as an exclusive peek into her life and we’d argue that plenty of photo content does that much better than a lengthy blog post ever could. It gives her a voice that doesn’t seem too manufactured (although it obviously is). Beyonce has launched a blog that so obviously belongs to the Tumblr platform (despite the flashy theme of course), which in many ways makes it seem much more natural. Although we imagine THOUSANDS of hours have gone into how to take Beyonce’s brand into the realm of social media, by setting up a Tumblr blog and planting herself in not only the social media community but the dedicated Tumblr community from the start, makes her efforts seem less forced and in a way she becomes a little more like one of us. Oh, despite the fact she’s married to Jay Z and is probably wearing a dress more expensive that our monthly wage in the majority of her photos. Whether you love her or hate her, you can’t argue that Beyonce’s late but highly-anticipated foray into social media not only sets her apart as a genuine and authentic person in the fake world of celebrity, but gives us a long-awaited peek into her personal life, which doesn’t give too much away, but certainly feels intimate. Google+ gets a redesign, does anyone REALLY care? we'd argue that plenty of photo content does that much better than a lengthy blog post ever could. However, as much as we can't get enough of celebrities here at Shiny Shiny, we're mainly interested in why Beyonce and her entourage specifically chose Tumblr to give us a sneak-peek into her enviable lifestyle. we're mainly interested in why Beyonce and her entourage specifically chose Tumblr to give us a sneak-peek into her enviable lifestyle.